What Was My Partner Trying To Say? I played social doubles recently, and my higher-rated partner tried to tell me a convention about shot placement in doubles. I don't get it; maybe one of you can translate? What I remember is that I took a low ball out of the air as an approach volley (I can't remember whether it was FH or BH volley). I hit it DTL deep to the player who was across from me and ended up around the service line. The opponent hit a lob winner over my partner's outstretched racket. After the lob winner, I said something to my partner like, "Gah! I should have angled that crosscourt. Then at least I would have made her run." My partner said, "You're right that you should have hit it crosscourt, but the reason isn't to make her run. You should always play your shot to the player who is front of your partner. That will make that player hit to me with their shot." I said, "I beg your pardon? I've never heard of that. In fact, I've been told it is risky to hit behind yourself, and hitting an approach volley to a net player is a no-no unless I can really attack it." My partner continued, "My pro teaches that you should be hitting to the player in front of me, and I should be hitting to the player in front of you." I'm sorry, but I do not understand this. Is there anything to what her pro is saying? i’d have played it the way you did. i’m guessing she was quoting a “rule” for when the “deep” person is diagonal of you.... but that didn’t seem to be the case. low defensive volley I always go to whoever is further from the net. You hit the right shot. Your partner was out of position. After you hit your shot, your job was to continue to the net to strengthen your position and get into "home base" as the lower-rated player staggered in front. Your partner should have been anticipating either a lob or a shot back to you. She should have stayed deep enough in the service box (staggered behind) to have lob responsibility covered, and also to tempt the opponent to hit to her as the higher-rated player. As for translating her pro? I think maybe she is thinking about the rule of thumb that when you are at the net during the action, you should always try to stay in front of the ball because the most likely shot will be straight away? I vote with @travlerajm. You hit deep dtl, come in and your partner fades back to service line as she is now the CC player. Although admittedly the right shot would be a drop shot in front of you if the opponent was really that far away at the baseline. Thinking about it from men's doubles perspective, unless you're hitting the ball at their feet, or with good pace that you think they'll have a lot of trouble with, NEVER hit it "to" the net player... you can hit it *AT* the net player, but any ball you hit *TO* the net player, you assume it's going to get put away. I don't know why this would be different for women's doubles. Would it? Thinking about it from the perspective of mixed - the general rule is that you hit it to the woman until/unless she proves you wrong with that strategy (sorry - I know that's sexist - but many a mixed match has been lost due to "chivalry"). So in your case, if the woman had been at the net and the man back deep, and knowing nothing else about the opponents - I would have expected that a) the man would have a better chance to run down any deep ball and b) would have a better chance at putting back a more difficult shot to deal with, so I would have definitely hit it to the woman at the net until she proved to me that she could handle the ball and make me wish I hadn't... anyway, you didn't mention any particular strength difference between your opponents, so I don't think this scenario applies to your situation, would it? So all of that is to say that I don't know WTF your partner was talking about and I don't find any significant error with the shot you played - it sounds like the opponent hit a good shot back against you - and after all, that's their job too, right? As I think more about it based on what you are all saying, I think crosscourt would be a shot selection error. 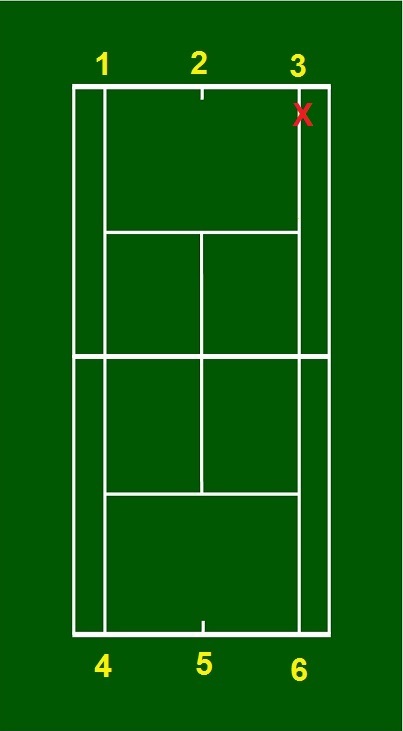 If I go crosscourt, then (1) my partner has to shift to cover DTL; (2) I have to slam on the brakes to get toward the T to maintain the staggered formation. Again, I believe your opponent just made a decent to good shot - which is what they're supposed to do. I think cross court is the "wrong" shot unless KNOW you can make a very good play off of it. For example, short sitter and you have the weapons/control to hit it very well at the opposing net player. As for who was supposed to cover that lob... I think people are saying it is your partner's job to cover that lob. It is hard to say without knowing the exact positioning but I believe it is your lob to cover. If you have an easy ball to approach on, you should be hitting a "good" approach shot. If I were your partner and I see my partner about to hit a easy ball hard, I am moving up anticipating the weak reply, and putting away the next ball. I am already at the net, its quicker for me to get there. As my partner is approaching, they will not be able to get to the net as close to me anyways and they should be the one slightly staggered behind me. Also, if they hit a bad approach shot, they will know it as soon as they hit it and be ready. If it's a forehand volley and you have a clear winner through the hole you take it, if it's a backhand you go straight up the middle. Deep corner dtl is risky because you are vulnerable to the XC lob. You call win a lot of points volleying short in front of you and closing to the service line. I'll start this with the caveat that almost everything can change based off the abilities of you and your opponents, but we can cover some generalities for sure. No. Ideally, you would prefer to 'force' your back opponent to play shots that your up partner can take, but I wouldn't necessarily anoint cross-court as the correct play. Along with some of the previous posters, I like the DTL shot because it's to the back player, and it's going to limit their opportunities to essentially lobs or shots at you (while at the net). Played well it really opens up the court for you while giving them the least advantageous place to play from. I bet her pro doesn't. Agreed. If you have a shot that can be put away easily, why would you hit it near someone and give them a chance to get a racket on it? Go where they aren't. I'll go low at a net person if I don't have another choice, and that's only because I'm hoping they pop the next shot up. More or less. The difficulty with up the middle is that all shots are in play, including the same kind of lob that won on the DTL. When you go DTL it becomes harder for them to play a sharp angle short across the net, which should allow your partner to relax off the net a little (and cover a lob better). As for who was supposed to cover that lob... I think people are saying it is your partner's job to cover that lob. It is hard to say without knowing the exact positioning but I believe it is your lob to cover. In most cases it will be her partner's ball. If I were your partner and I see my partner about to hit a easy ball hard, I am moving up anticipating the weak reply, and putting away the next ball. I am already at the net, its quicker for me to get there. Fundamentally, I disagree with the logic here. If it's a weak ball, you can approach and put it away after they hit. As the partner who is crosscourt, you will be expected to cover almost any lob - shorter distance, better path (probably forehand too). Also, because your partner is at the net, they would be able to cover most of the net, but importantly much more than you. There's no reason for the opponent to hit to you at the net if your partner is forced to stay back. That is going to be the easier shot for them. I don't know. This comes down to quality of shot right? If you can play the volley deep in the corner, and their only shots are giving you a defensive lob or feeding the player at the net... I'm good with that. That's why I practice overheads. Now if it turns out the opponents are great lobbers then I would go your route, but most people that I face don't handle it so effectively. Shrug, I have always been taught that balls over your partners head, is MY shot. If my partner cant hit an overhead, then I should be running diagonally to cover that lob as it is much easier to hit the ball on the run this way. It is difficult to run backwards and cover the lob that went over your own head. Your shot selection needs to consider how your partner plays. Does the partner stay glued to the net area? If the partner plays 1-up 1-back (I hate that) then you must be ready to cover the entire back court as well as your side near the net. Ideally your partner steps back to cover deep when the ball is cross court. She was correct - Assuming you can make the net person hit up, hit hard enough she can only stab at it, or hit it passed her. In your case, the net person was at the service line (a bad choice). It was more likely that you could make her hit up or mess up. Otherwise, if you can’t do any of those things, go Dtl, but thoughtfully. The idea behind this “rule” is: maybe your partner can get a sitter to hit. Also, you maintain a strong doubles position. I’ve seen many a 4.0-5.0 player go at the netman in front of him from the backcourt, with his partner at the net. WTF! First, your partner should have been at the service line and the other net person closer as you hit the ball. You would then never hit to her, regardless the “rule.” You and your partner should both expect your deep shot to be lobbed and position yourselves accordingly. As it happened, you could have pulled the ball into the middle. You would have probably forced them into an I formation. (Net person feels she might get it, while back person covers if she doesn’t.) From there, just pick an alley. Second, deep balls to a backcourter absolutely invite lobs. Shorter shots mean they are more apt to try to pass both of you. You should be more confident both of you cannot be passed. Hit shots not so easily lobbed. There is a lot to consider besides the rules. You described a lob going over the outstretched racquet of your partner. Sounds like an offensive lob. Which means maybe your shot let her hit an easy lob. Regardless, as her partner, your job is not to wait for her to call a switch. You should be trying to determine if she is capable of hitting it. It sounds like it was a close call. So, you would move back to cover in case she was wrong, or decided at the last moment it was impossible. It happens. ShaunS is correct in saying your abilities will determine much. However, it’s a good direction. There are a lot of variables: level, gender, height, opponents, not to mention the basic things I can't remember, like whether I was hitting a FH or BH. (It was probably a BH because most volleys I play from the deuce court are going to be BHs). But what I still do not understand is whether there is any basis for the idea that as a matter of shot selection, I should play the ball to the player in front of my partner, and she should play the ball to the player in front of me. I think one reason she gave is that I will have just played a shot and will need time to recover balance/position, whereas she is balanced and ready to hit the shot the player in front of her is going to have to hit. I do question the assumption that the opponents will play the ball to my partner instead of right back at me. This theory requires players to change the direction of the ball quite a lot . . . . I've been taught the opposite: A ball over my head is my responsibility. So I have to either hit it (preferably calling "Mine" immediately) or call a switch immediately. The reason to do it that way is to avoid partners falling behind one another to cover "just in case," which leaves the team out of position if the lobbed player hits a smash because half of the court was vacated for no reason. This is particularly important if the lobbed player is going to hit a defensive smash, which is still a better option than having the partner try to run to catch up with the ball and play a groundstroke. Sounds to me like a good way to get your partner hit. That's why I thought the right play was a drop shot dtl with an opponent deep and you moving in. Sounds way too generic. The most important determinant whether I hit at the net person is whether I'm hitting an offensive, neutral, or defensive shot. The more towards offensive, the more likely I'll go at the net person; the less offensive/more defensive, the more likely I'll go at the deep person to give myself time to recover. It won't be to your partner's advantage if you have to hit a defensive volley to the opposing net person who then hammers your net partner. She appears to be assuming you will force a weak reply. How applicable is that in 3.5 Ladies doubles, though? Even at 4.5 Mens and 9.0 Mixed, people don't necessarily choose that as their first option, mainly because it's not practiced much. That's why it works. Everybody's so programmed to volley deep. You just need to get it past the net person's feet. I would have played the ball deep too. About the only time I go right at the net person is on poaches and when serving and volleying. If you would have gone at the net person they probably would have played back to you and hitting the previous ball out of the air you likely would have been a bit off balance and not been in good position for the next one. Different strokes for different folks I guess. Maybe their pro teaches a really aggressive form of doubles. you can show her how bad of an idea that is by hitting fairly high easy shot to the player in front of your partner and see her eat the ball with her big mouth. then ask her or tell her,,,,,,,,"You told me to hit the ball to the player in front of you" ... What happenend ????????????????????? Correct. Generally speaking if the ball's going over your head that's a harder shot for you to cover. I've attached a terrible image to allow me some framing. The ball has been hit to position #3 at roughly where the X is. If they lob to #6 then that's probably something the ad-court partner should cover. If it's a good lob it'll be too hard for them to turn, get back, and rotate to play the shot. If it's short they should step back and take the mid-court overhead. Now if the ball goes from #3 to #5 then it's likely ad-court player again. It's normally going to be a forehand for that player, and it won't require any real "turning". Lastly, if they go from #3 to #4, this is where I assume the confusion sets in. If the opponent manages to actually get this ball deep, it's going to be a pretty skilled shot. But it's also going to have to travel a long way. For a deuce court player to cover this they'll have to be very fast or the lob very high. It'd be easier for you to go back because the hope is you don't actually have to play it from behind the baseline, but even if you do that'd be easier than the long run + turn for your partner. The reason to do it that way is to avoid partners falling behind one another to cover "just in case,"
There's a simple solution for that. When your partner goes behind you to cover a lob you should switch at the net. It actually presents you with a potentially strong position because if your partner plays the ball well you can almost hover in the middle of the court near the net and force them to hit a narrow target down the line past you or lob again. The most important determinant whether I hit at the net person is whether I'm hitting an offensive, neutral, or defensive shot. Realistically this can change *any* guideline, and it's why discussing scenarios can be a bit of a crapshoot. I believe the DTL shot is the "safer" one for a lot of players because the negative outcome is your opponent gets to hit a good lob. That's rarely a point ender, especially if your partner sees the weak shot and recovers back to be ready for the lob. Alternatively, if the weak shot goes to the net player, there's no adjustment time for your partner before a potential winner goes flying by. Again it's all situational, but that's my outlook. As much as it pains me to admit it, the first option in my head is *never* drop shot, even when it should be. That said, I do think that just going short with some angle is something more people should do, and it doesn't have to be a winner. Forcing a player to come up quickly and play a ball is difficult, and if it's to their backhand that's a hardship for any level. In this scenario though where you're volleying a ball around the service line to a player in front of you... I'd skip that for most people. Too tough to keep it low and get any angle compared to punching it deep to their feet. Shaun, I can't see the image. But to to clarify, I think covering lobs is simple for simple lobs. If the lob over my partner's head is so good she can't reach it, I have to cover it. If it is going right to her, I needn't fade back in anticipation of a switch. The trouble comes in when you have two at net in a staggered formation or a "build a wall at the service line" formation. In that case, I think the best way to play is for each player to take responsibility for lobs going over her own head. "Responsibility" means hit it if you possibly can, and call a switch quickly if you cannot. If we are in a stagger and lob goes over my partner's head and I can't take it out of the air and so have to run it down, we are in big trouble. Regarding whether we are left in a strong position after my partner switches behind me to play a lob . . . only if my partner is fast and has a good volley or swing volley. These are rare traits in my world. If I have to run down a lob on a switch play, I do not want my partner to remain at net. I will likely hit a weak shot or a lob, so she should fade back into a more defensive position. We should re-take the net together if we can. Staying at net while I am running down a lob is a suicide mission. I used to yell, "Come back with me!" as I was running down the lob, but the response after the opponents hit a smash at my partner's feet at net was usually, "What did you say?" Played some 3.5-4.0 level mens and mixed the last 2 days and that ploy works a lot when you have opponents deep. And I can tell you the 4.5 level 65 year old on the other side of the net last night was a master at it. From the same setup he could drop it or slice it deep at your feet so you were always guessing. Just great touch. I'm late, but your partner was full of beans. The default mantra is short to short, deep to deep. Her job would then be to find a way to poach and break the stalemate. I agree. But I wasn't implying it was not a smart choice; I was thinking the person might not have that shot in the toolbox. Yours is a, somewhat, unique case. Most times you’ll be hitting cross court from backcourt to backcourt. It works even if you are going to hit a stroke from the backcourt to two net players. It kind of makes sense. A pro could try to codify it. In your case, the deep player was in front of you. And, since you were hitting a low volley, presumably from nml, the safer shot would not be to the net player, no matter where they were stationed. So, play the situation, not necessarily the convention. You made the correct play. Trying to catch up on this one ..... So if opponents are still 1 up 1 back but you are both up, I would think hitting to the person still back is like a point death knell, of course you are likely going to get lobbed. If the lob over my partner's head is so good she can't reach it, I have to cover it. If it is going right to her, I needn't fade back in anticipation of a switch. True. For the sake of clarity, any time I'm saying "lob" in this thread I'm assuming it's a shot that's out of reach. Bad lobs are just good overheads . The trouble comes in when you have two at net in a staggered formation or a "build a wall at the service line" formation. In that case, I think the best way to play is for each player to take responsibility for lobs going over her own head. I would still go with the conventional wisdom here and recommend that your partner should cover. Same reasons as usual - they're going to be able to take a better "direction of approach" than you to play the shot. They also will have the potential benefit of being able to see the court as they go back to know what sort of shot will be required (ie. are the opponents rushing the net?). You would be blind to that if you had to turn and run to get it. Their vantage point from the side may also give them a slight improvement in telling the depth of the ball. If the shot is going to be short enough that you step back and take it, you should be able to call them off almost immediately when it goes up. These are rare traits in my world. If I have to run down a lob on a switch play, I do not want my partner to remain at net. I will likely hit a weak shot or a lob, so she should fade back into a more defensive position. Fair enough, much will depend on the attributes of the players on the court. I haven't played much with people in this situation, so my advice may not be applicable. I would think hitting to the person still back is like a point death knell, of course you are likely going to get lobbed. I've always viewed lobs as my opponents last resort not a point ending return. I'd definitely recommend a different approach to the point if that's how it works out for you. I guess my assumption throughout was that the opportunity to split the opponents for the win wasn't present though, otherwise take it by all means. If I'm left between giving my opponent the possibility to lob with their dominant hand from the middle of the court or from their offhand in the corner, I'll always take the corner. I also want to challenge the idea that playing a volley to a deep player is necessarily a mistake. Last night, I played a lady who had good groundstrokes on both sides when she was set up well. It was a little intimidating to come in against her groundstrokes. But I came in anyway. I didn't try to direct my volleys in a fancy way (changing direction, attacking net player, drop volley). Instead, I parked myself on the service line, stepped into each volley, recovered back to the service line, and did this repeatedly. Sometimes I had to hit several heavy and deep volleys, right back to her. But she would eventually either miss (trying to make me miss) or would try something low-percentage (that she would miss). I mean, if you've ever been in a drill class trying to hit good groundstrokes against two good volleyers at net you know how hard it is to survive multiple good volleys. This can't work in every situation, but I had a partner who could volley and understood positioning. If my partner cannot hold her own, then I can't just send my ball back to the deep player because they can just attack my partner. I agree that it's a death knell...but for the lobbing team. I *want* them to lob. 4 out of 5 times, it will be something I can smash, if not strongly, at least to maintain net position and hope for a weaker reply. Volleying to the net person without qualifying how difficult my volley is seems too dogmatic: if I'm digging a volley out of my shoelaces, I'm going to be avoiding the net person at all costs. I'm a fan of staggering also but because the approach went DTL instead of the usual CC, cindy's partner must now recognize that she is the CC person and should be the one further from the net. If she doesn't adjust, she might still be too close to the net and be more vulnerable to the lob. I'm with you: not only is it not a mistake, it's simply the best option under certain circumstances [ie I have a very tough volley and just want to buy myself some time]. I think that was very intelligent: not only did you make a good choice, it was one that didn't necessarily immediately pay off with one stroke; it took several and required longer-term awareness to recognize what was happening. Not everyone can do this: if it doesn't immediately work on the very first shot, they conclude it's bad strategy. Or if it takes several shots during a rally to work, they forget why they chose that strategy and abandon it for something else. Something to add to your toolbox: the drop volley. It doesn't even have to be a winner DV; just one that forces them to scramble. Likely, the net person isn't going to react because the ball isn't on "her" side. So it's up to the BLer but people who have solid GSs while balanced and behind the BL have weaker shots when moving forward and are well inside the BL trying to hit a low ball. Just loosen your grip [very difficult to DV with a death grip] and absorb the impact rather than blocking or adding to the speed. Practice it by having your hitting partner feed you match-style GSs and just experiment with grip strength and racquet face angle. Remember: you're not iniitally trying to hit a winner. That requires more accuracy and therefore, more risk. When starting out, just try to make it bounce halfway between net and SL with a bit of backspin. The first few times you do it in a match, the BLer might just stand there and watch it bounce twice or react way too late. If you can get good enough at hitting this shot, the fringe benefit is that now the BLer might creep forward anticipating the DV which makes your deep volley even more effective. A combo play works well also: deep volley that forces them behind the BL and, even more important, their momentum is temporarily backwards. Then a DV. I pulled this off against a 5.0 20-something guy and even he couldn't reach it in time. I hit three drop volley/drop shot winners last night, including match point. It was the right tool against the lady I described early. Solid baseline basher, but I could see in the warm-up and early stages of the match that she did not move forward well and usually netted the ball. I'm curious what the other team's reaction was: sometimes they will blame each other and then you know you've got them. Or the BLer will complain that you're not playing "real" tennis [whatever that means]. Or they'll grumble about you getting lucky ["Hello! I've hit the same shot multiple times! It ain't luck!]. No, the deep person took a few steps forward and then stopped. They didn't react otherwise. I set the ball machine to shoot at me and alternate deep and short volleys. You do realize that's hard, right? And Mr. Nobody doesn't know what he's talking about. Yep a solid strategy. don't put anything into the baseline basher's wheelhouse. At the 3.5 level its the rule of 3. If you can volley it back CC deep 3 times, the 3rd shot from them will be the error. Almost every darn time. The first couple times they are testing you, the third time they realize an average shot won't work so they try something riskier and miss. Many players have the "well if they return my hard shot back, I'll just have to hit harder" mentality and it can be used to great effect. Tennis isn't that complex. You hit an approach shot to the deep player and that's the percentage play. You can vary your approach shot to the weaker side of the deep opponent or you can even try to hit a short low slice as an approach shot but that's all just simple deviation of the core strategy. You do not hit approach shots to the net player but if you are trying to rip a groundstroke at a net player in the hope that they will miss, you can give it a shot but this should be used sparingly as it is not the percentage play and you really need a sitter to make it work. You do not always hit the ball to the player across from your opponent. If your pattern thinks this is how good doubles is played, they don't know what they are talking about. I've taken hundreds of doubles lessons and clinics and I've never had a single pro teach this.